Jacqueline A. Coyne, 76 of the Parsons section of Wilkes-Barre, passed away suddenly Saturday morning, March 16, 2019 at Geisinger Wyoming Valley, Plains Township, PA.
Born in Parsons, she was the daughter of the late John and Irene (Queri) Brader. 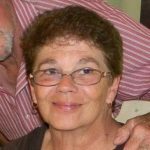 Jackie was a graduate of St. Mary’s High School, Wilkes-Barre, and was employed as a bank teller at First Eastern Bank, Wilkes-Barre, and last for Sears Department Store as a clerk for 27 years until her retirement. She was preceded in death by her sons Girard Coyne, Jr., and Christopher Coyne, and her brother Michael Brader. Surviving are her husband of 57 years Girard Coyne, Sr., daughter Angela Motley and her husband Charles, Shavertown, son Kevin Coyne and his wife Karen, Dallas, grandchildren April and Amber Coyne, Christopher Coyne, Connor, Christian, Kyleigh, and Kassidy Motley, Kaden, Gracie, Mollie, and Liam Coyne, brothers John Brader and his wife Barbara, Raleigh, NC, and Joseph Brader and his wife Patricia, Sinking Springs, PA, several nieces and nephews. A Mass of Christian Burial will be held Wednesday, March 20, 2019 at 10:00 am at Saints Peter & Paul Church, 13 Hudson Road, Plains, PA 18705, with Father John C. Lambert, Pastor, officiating. Interment will be held at the convenience of the family. Family and friends may call at church from 9:00 am until the time of mass on Wednesday. Arrangements by the Corcoran Funeral Home, Inc., 20 South Main Street, Plains, PA 18705. Memorial donations may be made to Candy’s Place, 190 Welles Street, #120, Forty Fort, PA 18704 in Jackie’s memory.